This is for switching to different voltage’s bulb for proper lighting in different voltages. Sometimes the electricity supply goes in series line and merely gives some 90-100 Volts instead of 220 volts. If that time we use any 110Volt bulb, we can get much light. But the problem is that the bulb will be busted instantly when mains voltage restores to 220volts. We need to switch the 110volt bulb off instantly for this purpose. Here we would use a relay(12V SPDT) to switch, we would use the NO contact for 220Volt bulb, and the NC contact for the 110volt bulb. Thus the relay have to be switched on at high voltages. 12Volt relays are turned on at 9.5 volts, and 12volt step-down transformers gives output of 9.5volts at some 150 volts input. So, I’m just using a transformer controlled relay circuit, which don’t need much components, calculations, transistors, etc. 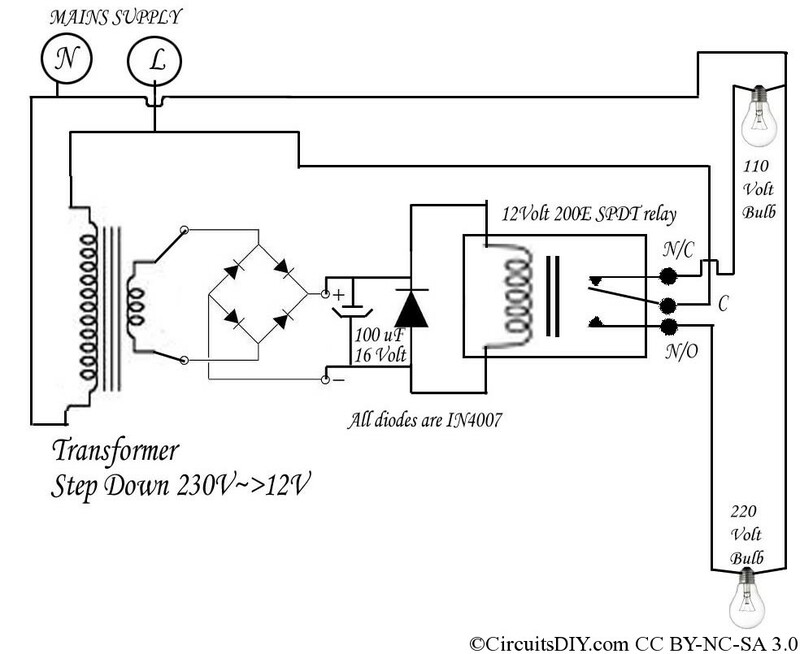 The circuit diagram below. 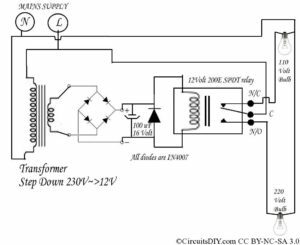 The circuit consists of one 220V->0-12V step down transformer rated at 250ma. The output is rectified and a filter is given there of low capacitance(100mfd/16v) as we don’t want much delay in switching. The DC voltage is directly applied to the relay coil. The mains live wire is contacted to relay’s Common terminal and bulbs are connected respectively. When mains voltage is 150V~230V then the 220Volt bulb will light, and when the voltage comes below 130V(relay holds NO operation upto voltage falling till 8.5V. At voltages below 130V, the 110V bulb will light. The overall power consumption of this circuit is not more than 3Watts. very good circuit i m also from childhood like electronics.